In 1988, Yannick Lemay obtained a college diploma in Plastic Arts from the Cégep de Sainte-Foy. In the following years, he joined the world of fashion as a professional model, in Toronto and Montréal. He travels and he develops a keen interest in photography. He returns to Québec in 1990. His professional life is then punctuated by cross-chasers, where his artistic impulses intermingle and oscillate between the world of the restoration and that of the fashion. In 1997, the birth of his son Alexis gives him the ambition and the courage to pursue seriously his artistic career. He offers his services to the media as a court croquist, with success. In 1999, He also became an independent cartoonist for Le Journal de Québec, where he produces « La semaine de Ygreck ». Thanks to the blog he creates in 2004, many people discover his talent and follow his daily work. This place of web exchanges allows him, among other things, to refine his style and develop colorful concepts. 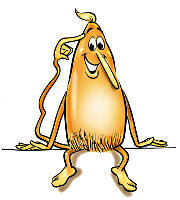 Starting in 2007, he comments on the news daily in Le Journal de Québec through the character of « Joe Bine ». Since 2009, he draws a cartoon a day for this same newspaper. Over the last ten years, the artwork of Ygreck was highlighted and he was invited several times to speak about it in various media forums such as radio, television and the Internet, as well as in vocational training schools and workshops. In addition, some of his drawings were published on the front page of newspapers. Today, Ygreck feels more free to exercise and expose his art, his critical mind is refined and he is not afraid to say what he thinks. — CARICATURE YGRECK (artist’s website) FR. 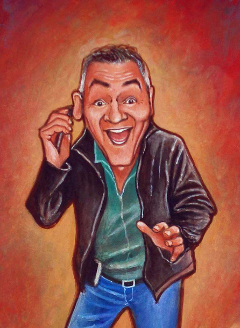 Passionate about caricature, regular participant of 1001 Visages, Christian Vachon will do us the honor of coming to present a caricature exhibition entitled « Chapleau revisite les grands maîtres de la peinture » with the professionalism that makes his mark. 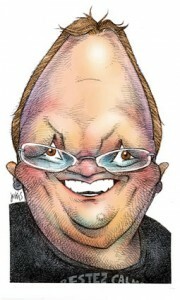 He will also benefit from his passage to interview Ygreck and Garnotte as well as some other caricaturists. Mr Vachon will open the Festival and talk about the artists present. — McCORD MUSEUM – MONTREAL SOCIAL HISTORY MUSEUM (Museum’s website) EN. 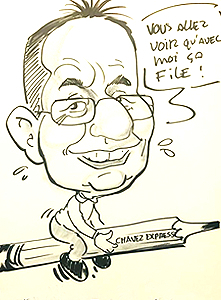 Recipient of the Prix Robert-LaPalme in 2007 during the second exhibition 1001 Visages, Bado (his real name Guy Badeaux) is the editorial caricaturist of the Ottawa daily French newspaper Le Droit. In the 1970’s, Bado realized comics pages for the Québec’s BD magazine Baloune, for Mainmise and Le Temps Fou. He also collaborated at the beginning of the satirical magazine Croc. Bado helped to found the Association of Canadian Editorial Cartoonists, in 1995, and chairs it for five years. 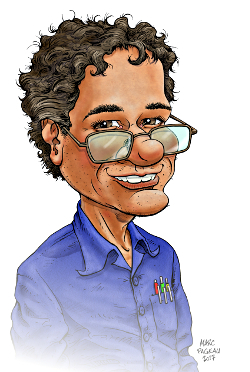 He is the editor of the annual review Portfoolio: The Year’s Best Canadian Editorial Cartoons during 22 years. Nine books collecting his editorial drawings have been published so far. — @GUYBADEAUX (artist’s twitter) FR. Wes Tyrell is a Toronto based illustrator/cartoonist. He works in Canada and internationally. He provided editorial cartoons for Yahoo! until this website closed its Canadian site. Wes creates illustrations for magazines in brush and ink in a unique, original and colorful style. He is also the President of the Association of Canadian Editorial Cartoonists. 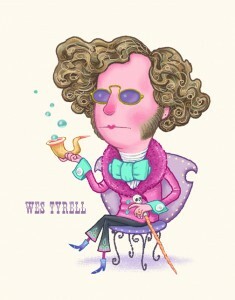 Wes will be present for the 11th edition of the 1001 Visages de la caricature Festival. — WES TYRELL ARTWORK (artist’s website) EN. 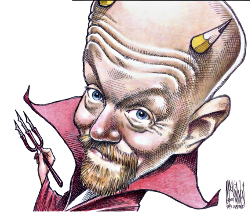 Born in 1961 in Nova-Scotia, Bruce MacKinnon is the official caricaturist of the dayly newspaper The Chronicle Herald from Halifax since 1986. He studied Fine Arts at Mount Allison University and graphic design at Nova Scotia College of Art and Design. During his professional career, he distinguished himself by winning several Prizes for his editorial caricatures such as 18 Atlantic Journalism Awards and six National Newspaper Awards. He finished at the second place for the World Press Cartoon competition in 2004 and earned the World Press Freedom Award in 2014. In 2016, he was made a Member of the Order of Canada. — @CH_Cartoon (artist’s twitter) EN. Born in Montréal in 1951 and after studies in geography, Garnotte has contributed as an illustrator, caricaturist or comic artist to several newspapers and magazines such as CROC, TV Hebdo, Protégez-vous, Titanic (for which he was also editor-in-chief), Les Débrouillards, La Terre de chez nous, Nouvelles CSN et Relations. Garnotte earned the Prix Robert-LaPalme in 2013. A Montrealer by birth, Yves Demers quickly distinguished himself with a manual dexterity not commonly found. He very quickly became expert in different expressions of art, including drawing, sculpture, advertising illustration, cartooning, conception and realization of decors, and computer graphics. After over ten years doing corporate and editorial caricatures, he joined the creative team at Studio Artefact where he conceived and built Christmas decors for major shopping centers worldwide, from Florida to Hawaii. 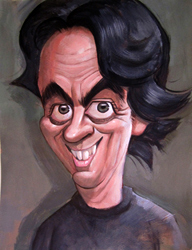 The art of caricature, however, continuously resurfaces in his life, justified by his pleasure of working with the public: “Drawing a face is akin to telling a story, and, for me, every face in the world is a beautiful story waiting to be told.” Yves was invited as the Guest of honor in the 2007 edition of the 1001 Visages. — CARICATURE YVES DEMERS (artist’s website) FR. 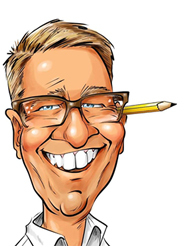 Martin Bouchard is an experienced caricaturist. For more than 25 years, throughout the year, he has criss-crossed the Québec province at special events and festivals, both indoors and outdoors (during the hot season). Bachelor of Arts – Major in visual Arts , drawing teacher, painter and illustrator, caricature logically added to the list of expertise developed by the artist. As a quick draftsman, he effectively captures each person’s face to caricature, often adding personalized anecdotes, in a unique style, between portrait and drawing in broad strokes. He knows how to create surprise and good mood, while promoting a close communication with the people to caricature. 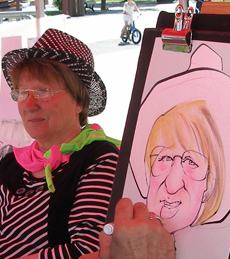 In addition to the caricatures made on site, there is the possibility of workshops specifically prepared for small groups of people interested in understanding and experiencing the caricature field. — MARTIN BOUCHARD CARICATURISTE (artist’s website) FR. Born in Montréal, but now living in Québec city, GAG (André Gagnon) was from the first bunch of illustrators who launched the comics magazine Safarir in 1987. Between 1987 and 1997, he was script, illustrator, lead script and production manager for the magazine. 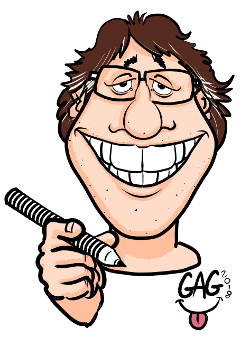 These days, GAG does the inking and the color for many professional cartoonists: Sampar (Samuel Parent), Tristan Demers, Jean-Philippe Morin, Jacques Lamontagne, Denis Rodier and André-Philippe Côté. For thirty years now he performs in corporation events, partys, etc… the rest of the year, he teaches his arts skills at elementary schools in the Québec city’s region. — GAG (André Gagnon) (artist’s facebook) FR. Coming from the Montréal area, Pierre Drysdale settles in Québec City in 1984. Comic book author, advertising illustrator and humorist, he publishes 2 albums as scriptwriter and draftsman whose second is nominated for the Prix Bédélys in 2002. He became author and artistic director of the comic magazine Zeppelin which brings together comic artists from Québec. He worked 7 years in the multimedia sector as a 2D Flash animator for web games and animated series for television. In 1991, he also became a live cartoonist for special events. Today, he travels everywhere in Québec to amuse people at conventions, cocktail parties, weddings, parties, and so on. 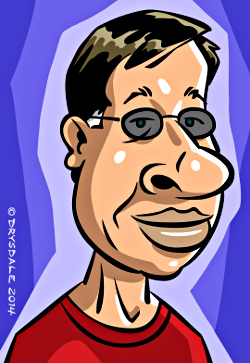 — CARICATURE PIERRE DRYSDALE (artist’s blog) FR. Born in Peru, David’s gift for drawing was noticed at the age of three. Upon returning from a zoo, he began drawing an elephant, the first in a series of many that led him towards his professional career! His artistic discipline includes studying at a school in California as well as a diploma in advertising design. However, above all, he’s an autodidact who perfects his technique with inspiration from books and working from photographs. Passionately absorbed with caricature and illustration, David Chavez participated in 1001 Visages from 2006 to 2010, and returns again since 2014 to exhibit his work and to draw caricatures live. — BIOGRAPHY 1001 VISAGES FR. Originally from Québec city and established in Beauce in 2006, Marc Pageau has been working in the fields of caricature, illustration and comics as a freelancer since 1991. After obtaining a Bachelor of Arts – Major in visual Arts from Laval University, he worked for several magazines including Safarir and Solaris (literary magazine of science fiction). Throughout his career, he has realized hundreds of illustrations for different organizations, including school publishers. 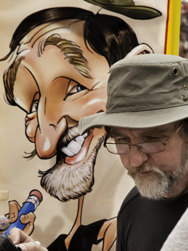 As a live caricaturist, he has been working at the Québec city international book fair for about ten years, as well as for several corporate events. An Art box entitled Carfaxitudes collecting together his illustrations in the genre Fantastique was published in 2015 by the editions Moelle Graphique. Recipient of some awards in comics and illustration, he deserves the Prix d’excellence in 2013 during the XIIIth International Editorial Cartoon Competition held by the Canadian Committee for World Press Freedom. — @LEMARCPAGEAU (artist’s twitter) FR. Robert Lafontaine began his professional career as editorial cartoonist for La Tribune de Sherbrooke and The Record, the two main newspapers in the Eastern Townships, followed by caricaturist-entertainer with art agencies. His cartoons have appeared in many periodicals and magazines as humorous illustration, and he worked with the editor of Magazin’Art for two years. In tandem, he also pursued other venues, such as painting and sculpture, and he recently illustrated a book for Alain Stanké. — @LAFONTAINECARIC (artist’s twitter) FR. Ludmila is a graduate of the University of Visual Arts of Muchina in St-Petersburg, and create her artworks in pencil, ink, pastel, and acrylic. She has exhibited in the United States, France, Spain, Belgium, Portugal, Russia, Italy, and Canada and received several Prix d’excellence from the Cercle des Artistes Peintres et Sculpteurs du Québec (CAPSQ). From pencils and markers on paper, by paint on canvas, or through a graphic tablet on her computer, Marie-Elaine likes to touch all sorts of mediums. 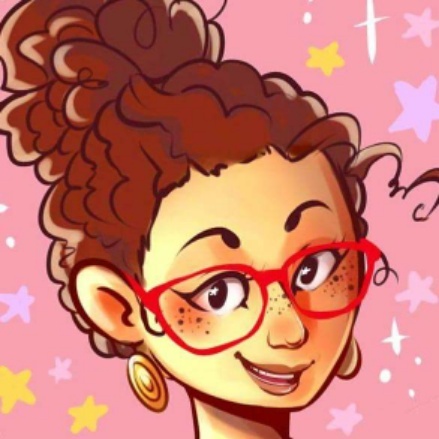 Very dedicated to comics, she was the founder of the Manga Club at the ICI par les Arts and Main Editor of the Comic Club at the Cegep de Saint-Jérôme, and loves helping people with the art of comic books. Tiffani is a passionate illustrator and 3D artist who has been drawing since childhood. 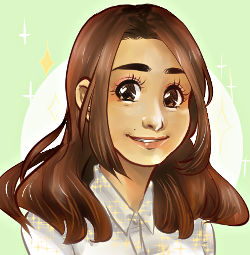 Accustomed to working with different styles and mediums, she finds inspiration in manga, fantasy, comics and fairy tales. — TIFFANI TROGI (artist’s portfolio) FR.